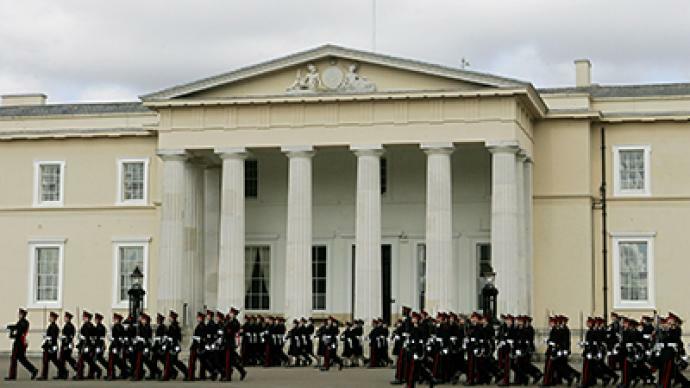 Britain’s Sandhurst military academy is renaming a hall commemorating those who died in a major World War I battle. The building will be renamed for the king of Bahrain, after the ruler donated £3 million to refurbish it. ­The hall will soon bear the name of King Hamad, instead of Mons, a battle that took place in Belgium in which 1,600 UK soldiers died; the 100th anniversary of the battle will take place soon. The Bahraini ruler gave millions to Sandhurst, the Telegraph reported. The military academy, located in Surrey also received a £15-million donation from the United Arab Emirates to build an accommodation block, which will be named after the UAE’s founding father, the late Sheikh Zayed bin Sultan Al Nahyan. ­The Battle of Mons was the first engagement between British and German forces on World War I’s Western Front, beginning on August 23, 1914. The conflict comprised one of the so-called ‘Battles of the Frontier,’ which took place in August 1914. The British found themselves heavily outnumbered by the Germans: 70,000 troops to 160,000, and 300 artillery pieces to 600. The British suffered some 1,600 casualties, and the British riflemen were so efficient, the German forces assumed their foes were using machine-guns. ­“There’s something deeply ironic in renaming a hall that was in memory of soldiers who died in a tragic battle in the First World War in honor of a king who is routinely committing human rights abuses,” Labor MP Jeremy Corbyn told British media. “To change the name of something which commemorates a very tragic episode in British military history, simply because they’re getting a sum of money from a rather dubious source, is appalling,” said Andy Slaughter, a Labor MP who is chair of the Commons all-party ‘Democracy In Bahrain’ group. “It reflects the appalling double standards the British Government and institutions have in relation to the Bahraini regime, which is guilty of all sorts of human rights abuses and fundamentally undemocratic." The online community reacted angrily to the move as well. “I doubt UK will condemn human rights abuses committed by allies whose leaders indirectly fund UK armed forces,” and "Sandhurst endorses mass torturing, child-murdering, iron-fisted dictator" are among the messages posted on Twitter in response to the name change. Bahrain, home to the US Navy’s Fifth Fleet, has come under fire from human rights organizations such as Amnesty International, which criticized the regime for its violent crackdown on protesters. 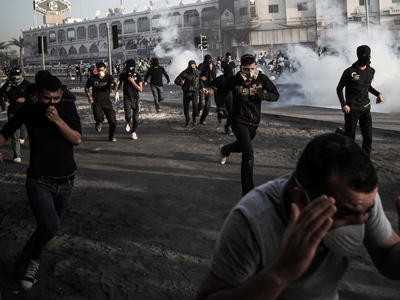 Tear gas, stun grenades, rubber bullets and even live ammunition have been fired on demonstrators, the Amnesty International said in its latest reports on Bahrain. 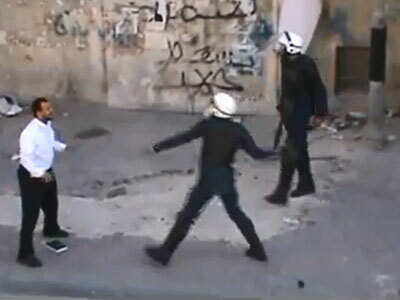 Tensions flared once again in the Gulf state over the past few days. Violent clashes broke out at the funeral of a teenager, who was killed on Thursday during a rally marking the anniversary of the popular uprising against the ruling monarchy. The procession was blocked and dispersed with stun grenades and tear gas, and several people were injured. Many nations, however, have been reluctant to criticize Bahrain. The US appealed to the nation’s rulers to negotiate with the opposition, but did not openly critique the regime. 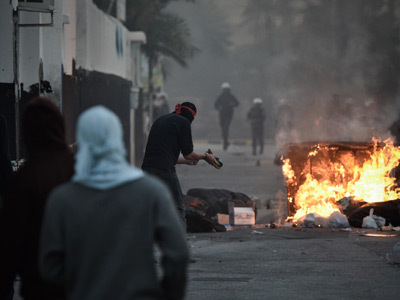 While scores of protesters in Bahrain were being fired on nightly with birdshot and tear gas, most of which was manufactured in Europe, the UK briefly suspended its export licenses to Bahrain. But after tensions eased slightly, Britain lifted all restrictions, and the Bahraini king paid a visit to the UK last summer. Amnesty International has criticized the US and UK for refusing to condemn human rights violations committed by their ally Bahrain.